Need a collection net for practicing serves? Have a table-top robot and tired of picking balls up off the floor all the time? You need a collection net! The Paddle Palace Ball Collection Net clamps to the table with metal brackets at each corner and includes side nets that extend to the center of the table. Place a container of your choice under the opening and hit away! Net extends 24 inches above the table top and 12 inches off the back of the table. Very portable! Folds to 15" x 32" x 1"
Clamps open to a maximum of 3.5 inches. Good net for serving practice. I thought I could use it with my Robo Pong but you cant unless you put the robot on the table in front of the net. 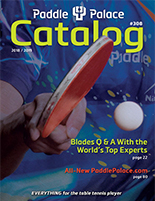 Hello Paddle Palace reviewers. If you are reading this I would like to say that this is the best ball collection net out there. We don't have a lot of options when it comes to collection nets. I have only found a couple of them that might be worth buying. But if you are looking for one, stop and buy this one. For the price and the quality you can't beat it. Now maybe Paddle Palace can put it on their daily specials so everyone can buy one at a even better price!!! For those of you who recently purchased an IPONG robot via Groupon or any other table top robot, this is the ball collection net to get. It comes full assembled, side nets are already included, easy to transport, set up and remove. The metal frame and support brackets are solid and the netting is durable. In other words it is a quality product.